Colectic was born as a cooperative in 2017, but its history goes back more than 25 years ago, since it is the result of the transformation of the Teb Youth Association into a cooperative. We participate in local and international projects. We manage one of the first telecentres in Spain, and led to the birth of the 1st telecentre network in Catalonia, in 1999. We currently work for the Catalan Government in the coordination and advice of 750 telecentres that are part of the Punt TIC Network. We are an interdisciplinary team and work with social institutions, training centers, universities and companies. 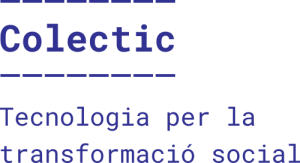 Colectic works in collaboration with the City Council of Barcelona, the Provincial Government and the Government of Catalonia.